Max Balchowsky’s Hollywood Motors was concealed in a medium-sized, unmarked garage hidden behind a Texaco gas station on a weed-filled, partially vacant lot less than 2 miles from the trashy glitter of Hollywood and Vine. There in the mid-’60s, in self-imposed obscurity, Max and his equally talented wife, Ina, spawned some of California’s fastest and most successful American-engined specials. 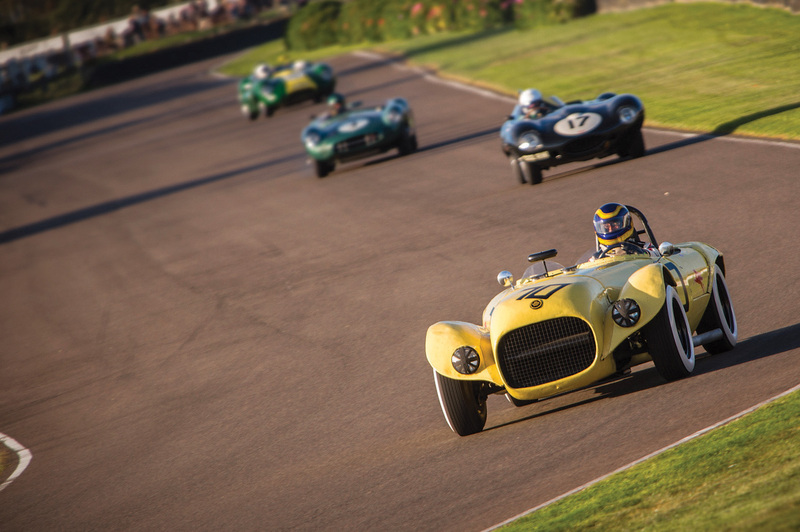 Only a few American chassis were built just prior to the Can-Am years, an era best known for the preponderance of front-engined Italian exotics owned and raced by wealthy sportsmen, so Max’s garage-built creations were the wondrous antithesis of the sleek foreigners. The Balchowskys’ less than aesthetically appealing Old Yeller specials became the bane of those who couldn’t understand or even begin to appreciate the unseen brilliance of their engineering. I worked for Max during those exciting years, and his pithy philosophy and super-practical approach to any problem forever changed my viewpoints on life, racing and design. Simplicity and low cost were his priorities. “Cheapest is the best” and “Nobody knows anything” were favorite sayings. His wry appraisals when observing supposed expert tuners in charge of exotic foreign machinery that wasn’t running anywhere near its potential were always hilariously on target. For fun he’d saunter over and innocently ask if he could have their just-drained motor oil or perhaps a set of spark plugs they had just thrown in the trash, knowing that such “used” material was still almost brand new. Such psychological warfare was best demonstrated by Old Yeller’s purposely crude-looking, Dzus-fastened exterior panels, which hid the innovative concepts that made Balchowsky’s homebuilts so successful. In a sport rampant with the fear of failure, Max was an apparent risk taker, an iconoclast always experimenting, but in reality he was a coolly calculating designer who never made rash decisions. Even on the weekends he wasn’t road racing, he’d drive his Buick-powered special out to the local drag strips so he could test some new idea with a few passes down the quarter-mile. He was such a local celebrity that the gates would magically open for no charge when the tower officials saw him approach. They’d announce his name and allow the crusty yellow racer to come directly to the starting line, make a few passes, and then depart to the applause of his fans. Max never owned a trailer. 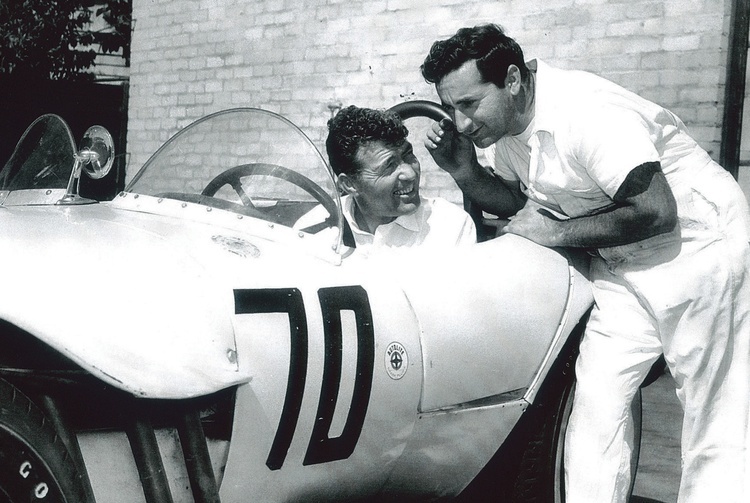 He was a firm believer that miles driven on the street ensured complete reliability on track. His cars were always driven to the races by a shop assistant, while Max and Ina followed in their matching yellow Buick Riviera. Upon its arrival, Old Yeller’s relatively quiet side-mounted truck mufflers would be quickly replaced by straight pipes carried in the Riv’s trunk. The car was now ready to race. 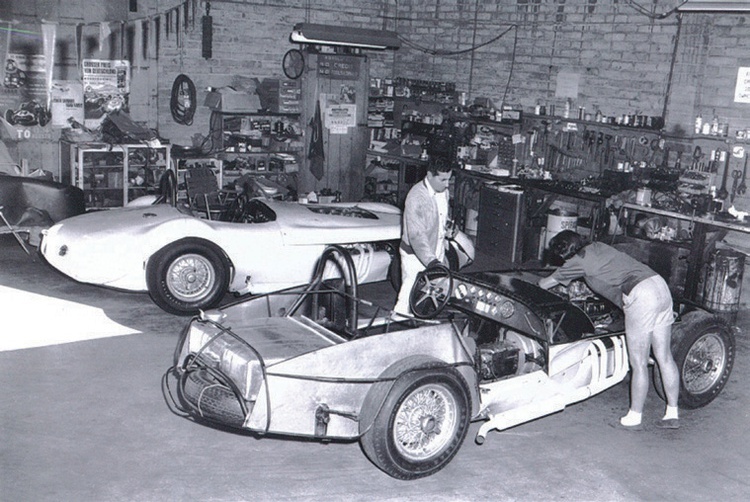 Max’s pit equipment consisted of a jack and a small Snap-on toolbox that held the few carefully selected sizes necessary to disassemble and examine any questionable component after practice. Balchowsky’s insistent use of whitewall “street” tires was a constant source of amazement and incredulity when others were using proven racing tires from Pirelli, Dunlop or Continental. When asked why, he’d earnestly explain to the gullible that the gas station in front of his shop had a sale on whitewalls and had given him a good deal. The truth is that Max had gone to Akron to study tire construction with the engineers who designed them. They in turn had given him a small instrument about the size of a pocket watch, called a durometer, to test the Shore hardness of tire treads. Being a drag racer, Max knew a certain amount of tread suppleness gave improved traction. He constantly tested every tire he could get his hands on and soon learned that premium Vogue whitewalls, sold as an option on expensive sedans of that era, were softest. 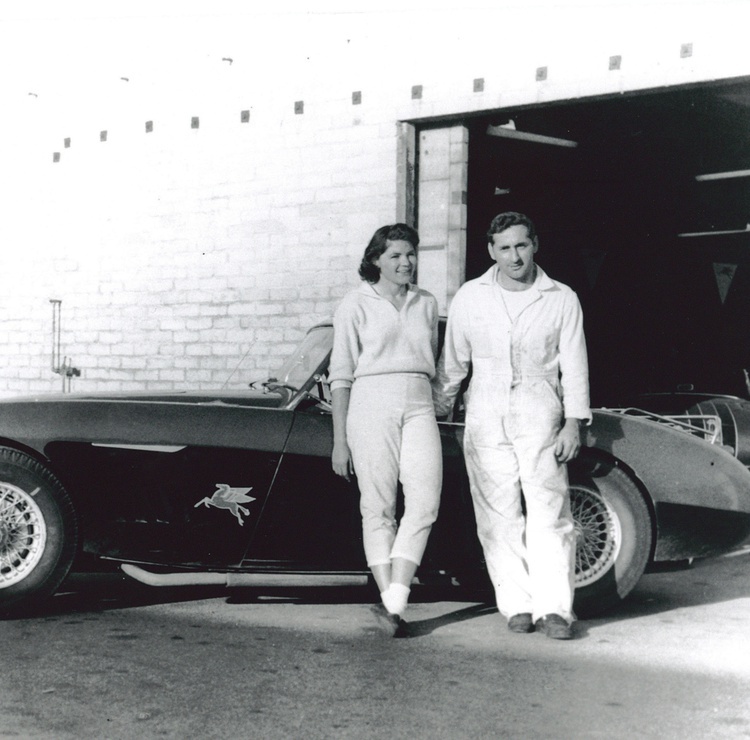 Max and Ina Balchowsky specialized in repairing, tuning and modifying foreign cars for an elite Hollywood clientele who couldn’t find the talent to keep their glamorous machinery running properly. Instead of trying to deal with uncommunicative or uninterested factory contacts in Europe, Max figured it was always faster, easier and far less expensive to create his own superior replacement components derived from American parts scrounged from junkyards. With an almost encyclopedic cross-referenced knowledge of which American-made components might fit into some foreign housing with some careful machine work, Max could, for example, replace the blown ring and pinion in an alloy Maserati differential case within days for a fraction of the cost of importing some weaker, obsolete, almost nonexistent part. Blown engine? No problem. An American V8 with more power, torque and reliability would usually fit. This, of course, drove the purists crazy, but his clients loved it. Hollywood, after all, was about appearances, not reality. Many of the Balchowskys’ jobs were for the movie industry. Their best-known work may be the several identical Mustangs made for Steve McQueen’s “Bullitt.” All were built at Hollywood Motors. Buick V8s were Max’s specialty in an era when the speed equipment industry was concentrating its efforts on small-block Chevrolets and Fords. Many wondered, “Why Buicks?” As usual, it was a matter of cost. Balchowsky could build a racing Buick engine for hundreds of dollars less than a comparable hot Chev’ small-block or 289 Ford V8. Max was wise enough to research and understand the merits of improved induction flow when others hardly knew the science existed. He discovered many speed secrets by hanging out with professional motorcycle racers and tuners, who used their self-built dynamometers and flow benches to extract more power from their single- or twin-cylinder flat-trackers. As a result of this experience, Max built his own flow bench and began laboriously comparing every cylinder head he could find. While others were pursuing the “common wisdom” of porting intake runners as large as possible and using larger valves, Balchowsky discovered that his “nailhead” Buicks, with their smaller-diameter intakes, actually encouraged greater efficiency by straightening port flow instead of impeding it with larger-diameter valves. When Max’s first Buick-engined special, a ’32 Ford roadster called the Buford, began winning consistently, he became a back-door recipient of support from Buick despite it being technically verboten for any GM division to be involved in “performance-related” activities. Much like Smokey Yunick in Daytona, Max quietly defied the status quo in those days of the so-called corporate AMA ban on racing. He constantly tried innovative ideas that he simply saw as common-sense solutions to problems that mystified Detroit’s finest. 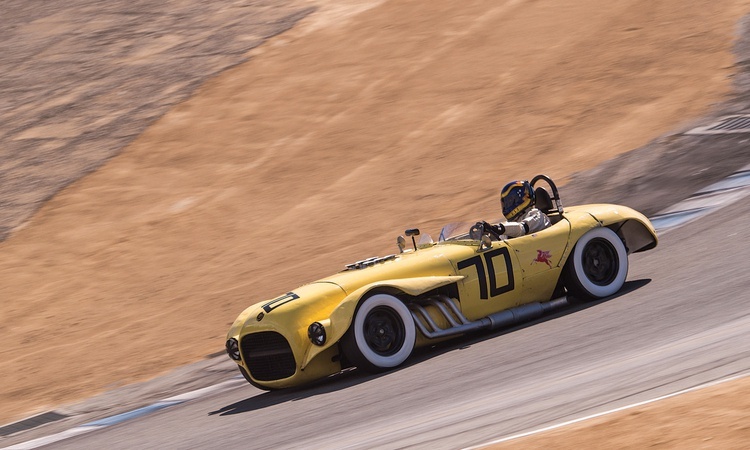 Of all the specials Hollywood Motors built, Old Yeller II, constructed in 1959, is probably the most famous. Driven often in the day by the likes of Dan Gurney, Carroll Shelby, Bob Bondurant, Billy Krause, Bob Drake, Paul O’Shea and Max himself, it became a blue-collar crowd favorite because of its apparent underdog appearance when, in fact, it was equal in performance to the finest from Europe. With a simple 1¾-inch chrome-moly tube-frame chassis fabricated over chalk lines drawn on the shop’s concrete floor, Old Yeller II was elegantly simple. Its double A-arm front suspension was a clean combination of drilled Jaguar uppers with lowers made of shortened Pontiac units and their integral ball joints. Most people assumed the holes in the Jag A-arms were for lightness, but they were actually added to purposely weaken them. If the car happened to slam into a guardrail, the A-arm would crush, saving the chassis’s attachment point. A crashed Morris Minor supplied the torsion bars and rack-and-pinion steering. At the back, a Studebaker live axle on leaf springs used a locked ring and pinion to ensure all power went directly to the pavement. One of the few uses of “modern material” was the alloy sheet-covered honeycomb panels used for the firewall and flooring. They functioned as lightweight barriers for heat while adding strength thanks to the webbing found between the tubes. Max’s Buick engines were the result of constant experimentation and tuning. His most intriguing tuning component was a hand-fabricated log manifold fitted with six Stromberg 97 carburetors, although a later, simpler iteration used just four and then even later reverted to six. Max, as a result of the influence of his motorcycle racing friends, was always careful to keep port mixtures as close to identical as possible. 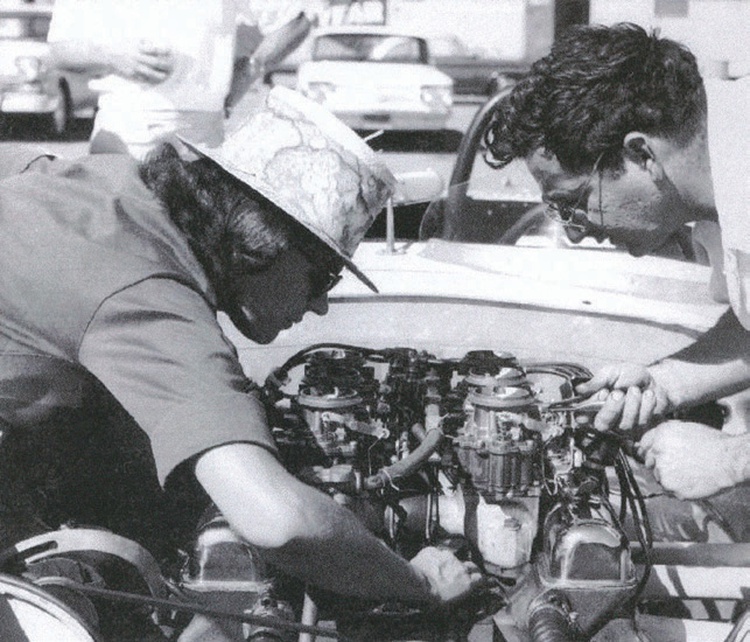 Ed Winfield, a personal friend of Max’s, used the Balchowsky Buicks as test engines for a continuing supply of custom camshafts. The 401-cubic-inch Buicks delivered an unsurprising 350 horsepower, but as Max used to point out, it wasn’t peak power that won races; it was the amount of “power under the curve,” referring to the broad torque curve that gave his Buicks such flexibility on track. A set of tubular headers that exited under the fenders kept the heat out of the engine compartment and cockpit. A simple locking pin held the straight pipes in place. A four-speed Jaguar transmission could have been a weak link with the torquey Buick, but Max was always careful to select drivers who used a relaxed hand when shifting. Disc brakes were still a rarity in those early days, so again Balchowsky reverted to Buick as a source for stopping power. Alloy Buick drums with plain 16-inch steel wheels at all four corners were in obvious contrast with the light alloy Borrani wire wheels run on much of the competition, but it didn’t seem to matter. Max certainly understood the value of less unsprung and inertial weight, but until that was really needed, cost was still a priority. 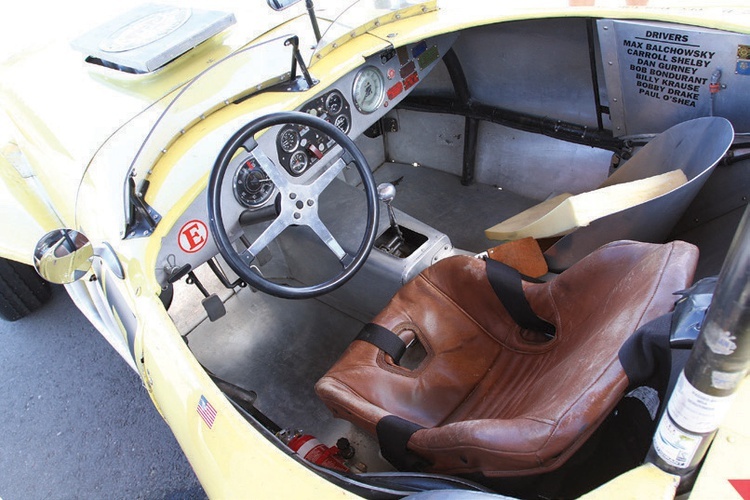 What was remarkable about Old Yeller II was just how friendly it was to drive on the street. I remember driving it out to the races at Santa Barbara one weekend. Clutch engagement was so smooth that it was remarkably easy to drive in crowded traffic. The reason was simple: Instead of the solid clutch disc fitted with metallic lining favored by many in racing in order to save a few hundredths of a second, Max used a stock, sprung center hub with specially bonded linings. The sprung hub, he explained, absorbed the shock of differing rpm when shifting and eased the load on the Jag trans. It was always a pleasure to ride with Max, as his smoothness seemed in complete contrast with the car’s rough-hewn exterior. 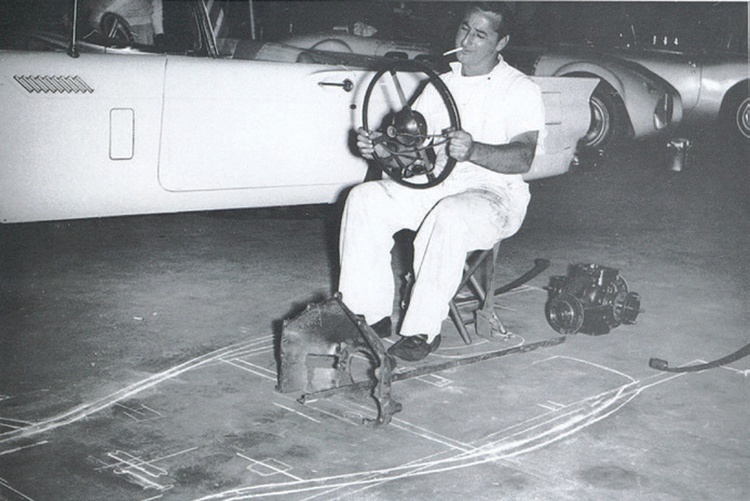 When shifting, he’d use his fingertips to select each gear and precise heel-and-toe double-clutching to match the revs. After I’d worked for Max for a while and began to understand what an impressive piece of equipment he had, I offered to design a new body for the car. I’d been working at GM Styling prior to moving back to California to start my own racing career and felt that his chassis deserved something more elegant. He just laughed and pointed out that on the short tracks we ran for club racing in those days–about 2.5 miles per lap average–aero efficiency hardly mattered. “It’s power to weight that counts,” he said. “Besides, a new body would cost more than a thousand bucks,” he continued. Ina, who had actually drawn up the chassis on graph paper in their office, once showed me the receipts for building Old Yeller II. Sitting at the starting line when it was first finished, it had cost about $1600. 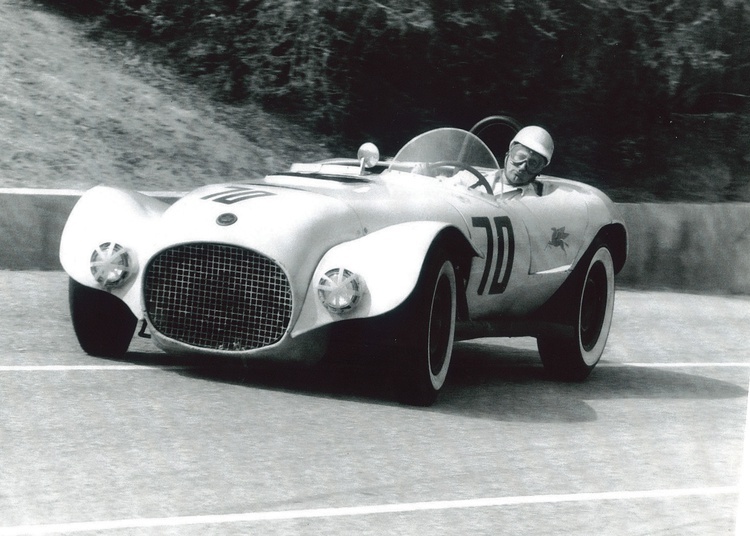 There were, of course, many long nights invested as well, but even with those hours included the tally was easily a quarter of what it cost to field a top Ferrari or Maserati. Old Yeller is still racing today in events all over the world. 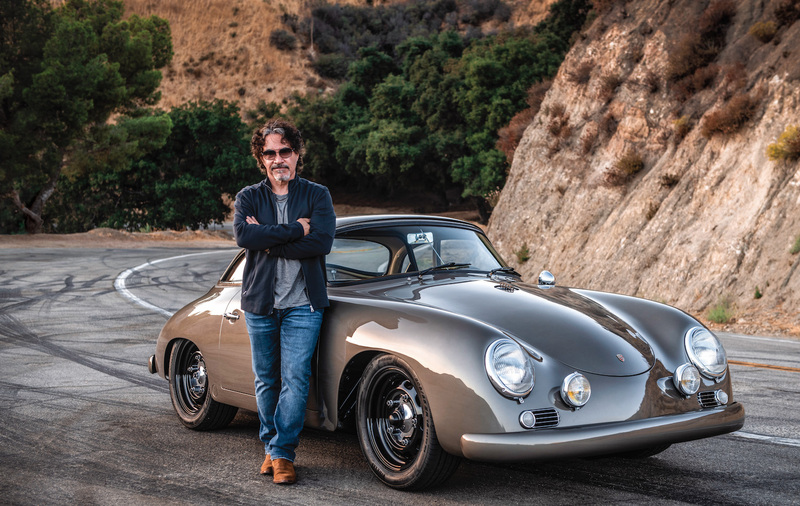 Ernie Nagamatsu is the owner, driver and present custodian of this piece of history, and in recent years he and his wife, Elaine, have brought the car to several prestigious vintage events in Europe, Australia, New Zealand and, yes, Monterey. It has been invited to Goodwood 11 times as well. Ernie loves driving the car and respects its heritage. He says the “value added” to living with and racing Old Yeller II is the many hours he spent with Max Balchowsky, getting to know the man and how he thought. “It’s fast, fun, very reliable and thanks to Max it’s the least expensive race car to maintain I’ve ever owned,” he reports. I think I just saw that car on Jay Lenos Garadge last night. It was in storage in the basement of a museum.